NEW DELHI -- Philippine president said he pities Myanmar leader Aung San Suu Kyi for being the focus of international criticism over her country's handling of the Rohingya refugee crisis. President Rodrigo Duterte said he told Suu Kyi to ignore human right activists, describing them as a "noisy bunch." Suu Kyi and Duterte met in New Delhi this week at a summit of Southeast Asian leaders on the 25th anniversary of ASEAN-India ties. Nearly 700,000 Rohingya have fled Myanmar's Rakhine state for Bangladesh since the beginning of August, after Myanmar security forces began "clearance operations" in their villages in the wake of attacks by Rohingya insurgents on police posts. The UN has described the campaign as ethnic cleansing. Though Suu Kyi has been the de facto head of Myanmar's civilian government since her party swept elections in 2015, she is constitutionally limited in her control of the country and the military is in charge of the operations in Rakhine. Still, Suu Kyi has faced widespread international criticism for not speaking out in defence of the Rohingya, especially given her history as a Nobel Peace Prize winner. Former New Mexico Gov. Bill Richardson resigned suddenly from an advisory panel on the crisis this week, calling it a "whitewash and a cheerleading operation" for Suu Kyi. 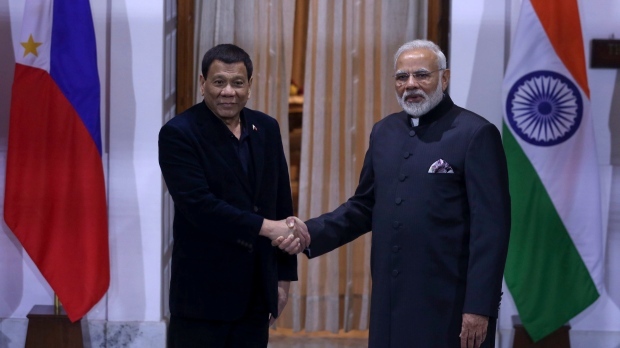 "I pity her because she seems to be caught in the middle being a Nobel Prize winner for peace and this," Duterte said Friday at a meeting of the Philippines-India Business Forum in New Delhi. "We are talking about our country, the interest of our country, our own country, and I said, 'Do not mind human rights (activists). They're just a noisy bunch,"' Duterte said. Duterte is a regular target of criticism for his deadly war on drugs, which has left thousands dead over the past 18 months amid allegations of extrajudicial killings by police and other rights abuses.